Legislature conducted an open forum discussion about a resolution concerning the app Yik Yak. Photo by Rupsha Basu/News Editor. The 48th Legislature of the Student Government Association (SGA) passed a resolution denouncing the usage of anonymous gossip app Yik Yak as a platform for hate speech or harassment at a meeting last night. College sophomore and SGA Campus Services Chairman Max Zoberman authored and presented the resolution. 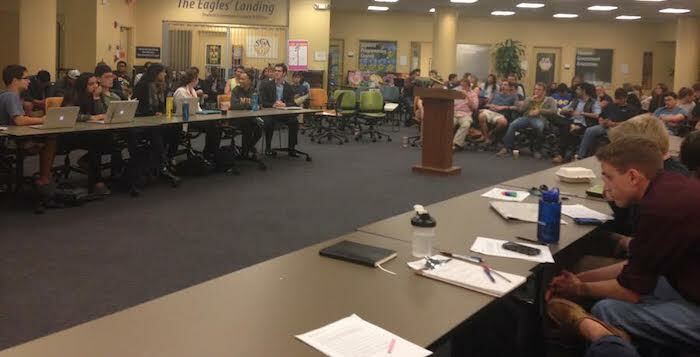 More than 50 students attended the meeting, a substantial increase from most SGA meetings. When the discussion was opened up to non-SGA attendees, many people defended their positions. The resolution passed via an 18-0-6 vote after SGA approved an amendment proposed by College senior and SGA College-wide Representative Aaron Tucek that significantly changed the original objective of the bill. In its initial form, the resolution was a statement from SGA advising the University to ban Yik Yak on its wireless network. Tucek’s amendment was presented as a response to the prevailing sentiment within SGA that the original resolution overstepped SGA’s bounds. Following a debate involving both SGA representatives and members of the student body, Tucek’s amendment removed the recommendation of a Yik Yak ban from the University Wi-Fi and instead added a binding suggestion for SGA’s Student Life Committee to develop initiatives dealing with hate speech on campus. After a first amendment proposal failed due to a lack of concrete measures to promote cultural sensitivity, Tucek’s amendment included such concerns from SGA members like College junior and SGA Junior Representative Jaanki Patel, who wanted to include actionable steps for which SGA and the University could be held accountable. Furthermore, the resolution issued a call to the University to create initiatives to prevent and handle such issues, particularly on anonymous forums. Zoberman began the conversation by clarifying aspects of the resolution that he claimed were widely misunderstood by the student body. SGA School of Law Representative J.J. Gonzalez (3L) opposed the resolution. Other legislators also opposed the resolution on the basis that it violates students’ right to free speech. Several students who spoke against the resolution on the basis that it violated their rights pointed out that Yik Yak already has a means of policing itself through users down-voting and reporting of offensive posts. Others urged SGA to educate the student body against such behavior instead of making a statement they said would be futile. College sophomore Lolade Oshin stressed the necessity of the resolution. Some students who supported the resolution referred to the lack of accountability on the part of anonymous users on the internet. Likewise, College sophomore Ellie Studdard condemned Yik Yak’s role in perpetuating anonymous hate speech on campus. “Emory prides itself on diversity, and yet, with allowing anonymous posts about specific groups on campus … anonymity here [means] we’ll never be able to stop it,” Studdard said. Nearly all of the people who spoke at the meeting praised the objective of the resolution and expressed gratitude towards Zoberman for raising the issue. Ultimately, SGA passed a substantially altered version of Zoberman’s resolution. Is she insane? On what planet do you have a right to not have your feelings hurt? Pingback: Tablet Accessoires – Hoe gevaarlijk is Yik Yak, de nieuwste hype onder geheimenapps?